We recommend the author to use this application to manage the references. JPIS use Turnitin for plagiarism screening. JPIS (Jurnal Pendidikan Ilmu Sosial (English: Journal of Social Sciences Education)) publishes high-quality manuscripts on research in the fields of social science education and social sciences. As for those included in the social science family is Geography, History, Sociology, Economics and Religion, Tourism, and Communication. JPIS publish twice a year in June and December. 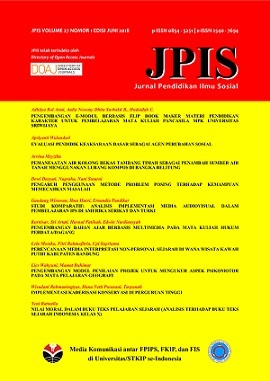 JPIS is published by Faculty of Social Science Education, Universitas Pendidikan Indonesia. JPIS editors ensure that the article publishing process runs objectively through a double-blind review. JPIS is licensed under a Creative Commons Attribution-NonCommercial-ShareAlike 4.0 International License.